Ram Prabodh Yadav (b. 1970) is sub-inspector (deputy inspector) of police in Maner Block, Patna district, State of Bihar. Monthly salary: 10,000 rupees (131 euro). Thomas Harris (b. 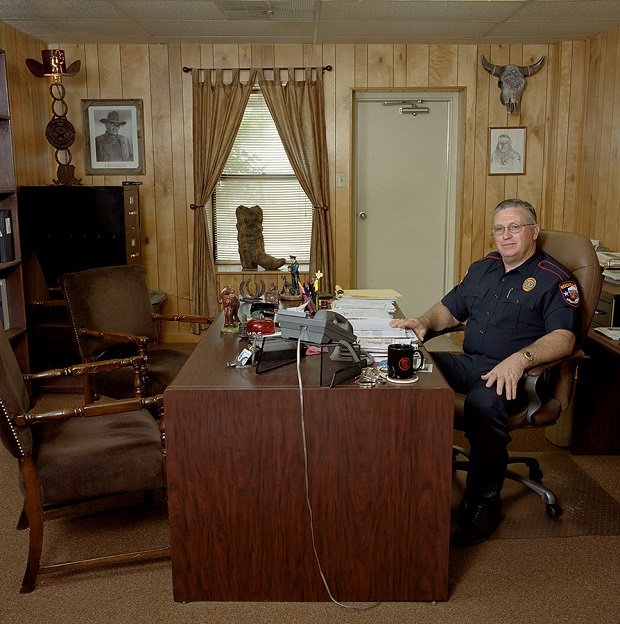 1949) is chief of police of the city of Rockdale (some 6,000 inhabitants), Milam County, Texas. Monthly salary: $4,250 (3,162 euro). 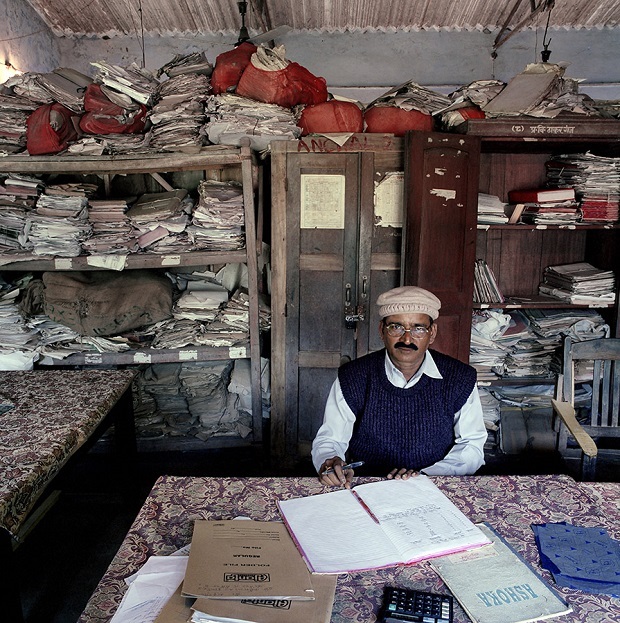 The word ’bureaucracy’ has a negative connotation. It suggests unnecessary paperwork, inefficiency and unfriendliness. This negative perception is created in time, by people’s repeated experiences, and the degree of resentment towards this system of government differs per country. 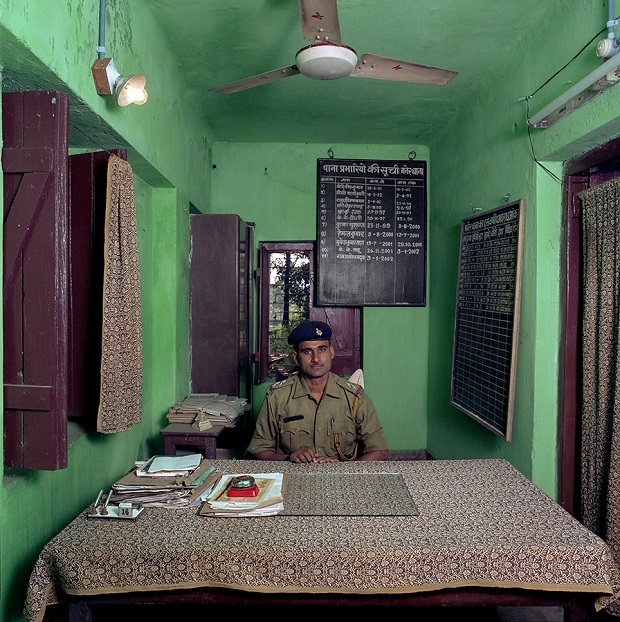 For his series Bureaucratics, Dutch photographer Jan Banning traveled to eight countries on five continents, and visited hundreds of offices, documenting the culture, symbols and rituals of state civil administrations and its servants. Civil servants are to an extent the face of the government. Banning’s images are full of details, and the stories describing the civil servant’s task and his salary are illustrative for the relationship between the state, the civil servant’s rank and power. Banning’s visits were unannounced, and the images reflect what a local citizen would see when coming inside. Each photo is shot from the same height, the height of a standing person. But the photos put these offices in a different perspective than what a visitor actually sees. Most likely, the people that come in are more interested in solving the issue that brought them there, than in paying attention to these places. 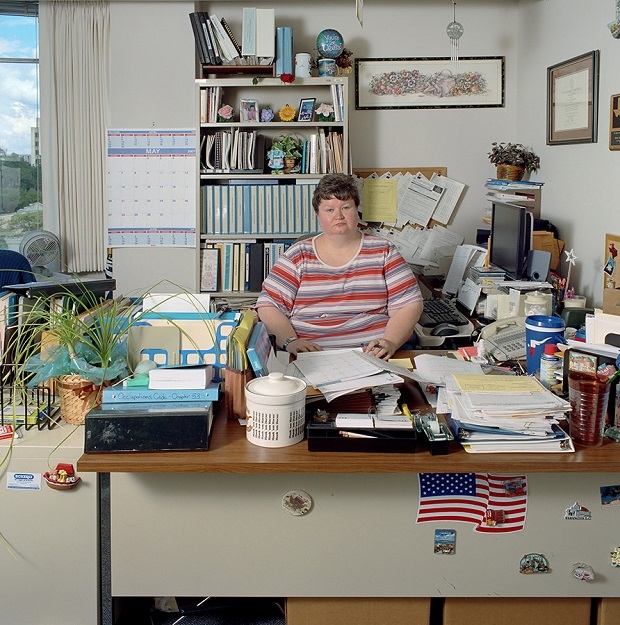 In a way, these photos make these offices and the people in them truly visible for the first time. The series Bureaucratics has been published in a book that is available together with Jan Banning’s new book “Red Utopia: Communism 100 years after the Russian Revolution” which was released on the 14th of October. Josué Galarza Mendez (b. 1969) is police constable in Betanzos, Potosi department. 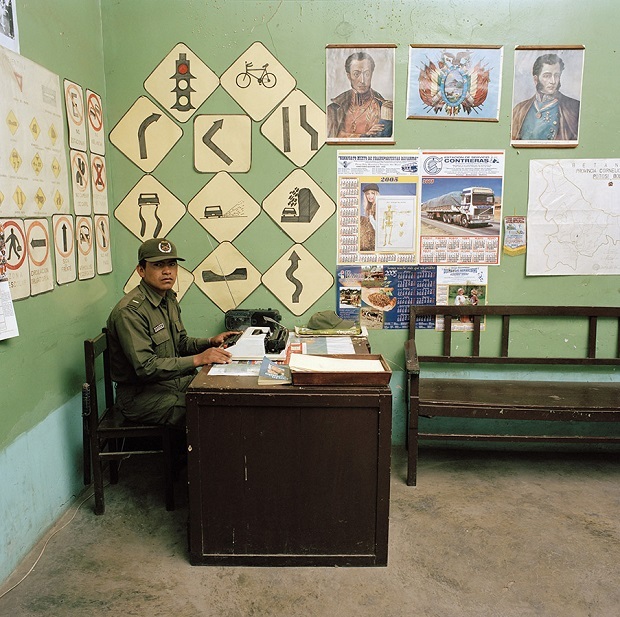 The police post has 5 men, among other things responsable for safety on the main road from Potosi to Sucre. And they try to solve thefts and burglaries. The bureau has one motorbike. The typewriter is Mendez’s private property. In emergencies, he uses his own mobile phone. Policemen have only truncheons for weapon. Whoever has a gun, has paid that himself. 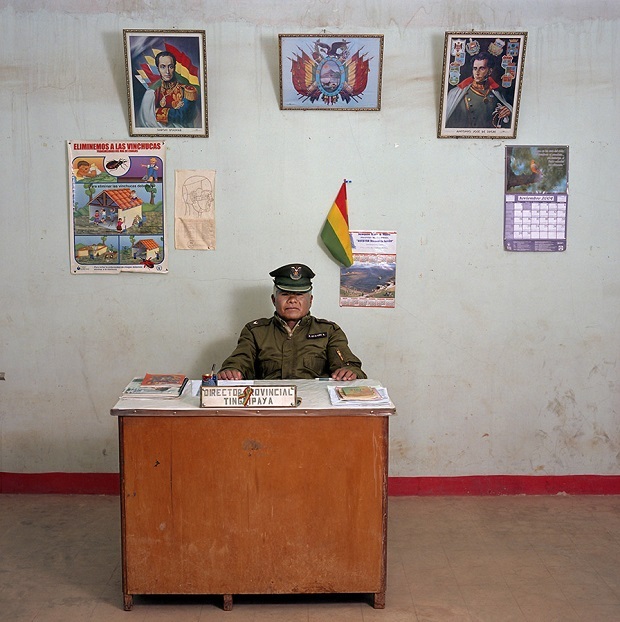 His monthly salary: 977 bolivianos ( euro 109, US$ 122). Zhang Mao Guo (b. 1966), employed by the Office of Justice, is an official teacher of Justice and Values to villagers in Tianping Town, Daiyue District, Taian City, Shandong province. Monthly salary: 1,500 renminbi ($ 186, 138 euro). 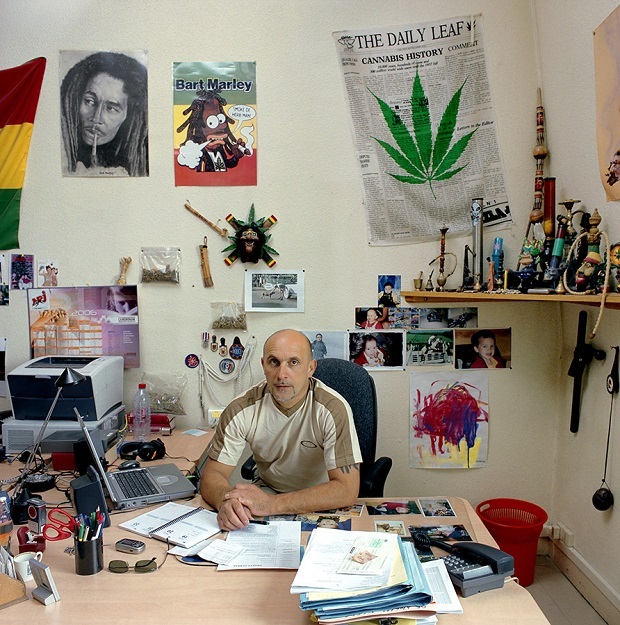 Roger Vacher (b. 1957) is a narcotics agent with the national police force in Clermont-Ferrand, Puy-de-Dome department, Auvergne region. Monthly salary: euro 2,200 ($ 2,893). Laurence Maillard (b. 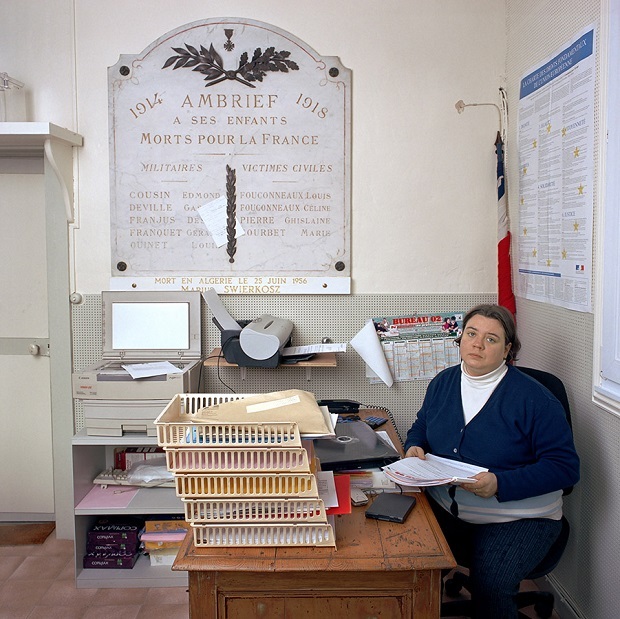 1965) works seven hours per week as town clerk in Ambrief (population 72), Aisne department, Picardie region. He holds the same position in another village nearby, working a total of 19 hours per week. Monthly salary: 500 euro ($ 657). Behind her a plaque, remembering the village’s dead from the First World War. Surinder Kumar Mandal (b. 1946) is circle inspector of taxes in Thakurganj block, collecting taxes in a specific part of Kishanganj district, State of Bihar. Monthly salary: 9,500 rupees ($ 208, 189 euro). Major Adolph Dalaney (b. 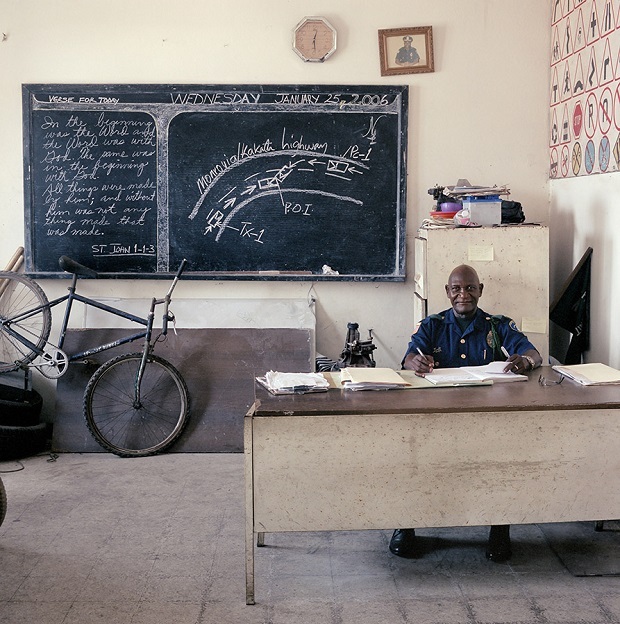 1940) works in the Reconstruction Room of the Traffic Police at the Liberia National Police Headquarters in the capital Monrovia. Monthly salary: barely 1,000 Liberian dollars ($ 18, euro 17). Traffic accident victims at times are willing to pay a little extra if Dalaney“s department quickly draws up a favorable report to present to a judge. Brama F. Nyé (b. 1962) is head of the Revenue Office in Smell-no-Taste, Margibi County. 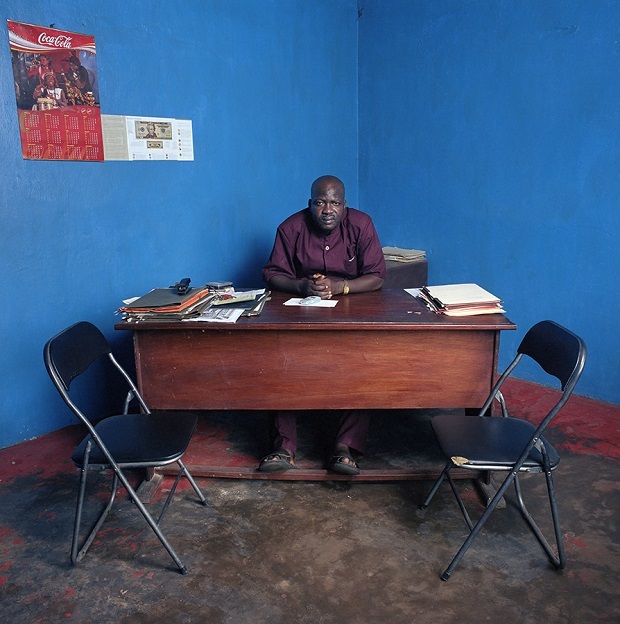 Once a month, he drives in a rented or borrowed car to Monrovia to deliver hundreds of thousands of Liberian and American dollars to the Central Bank of Liberia. Monthly salary: 1,080 Liberian dollars (US$ 19, euro 18). Marina Nikolayevna Berezina (b. 1962), a former singer and choir director, is now the secretary to the head of the financial department of Tomsk province”s Facility Services. She does not want to reveal her monthly salary. Yevgeny Leonidovich Bill (b. 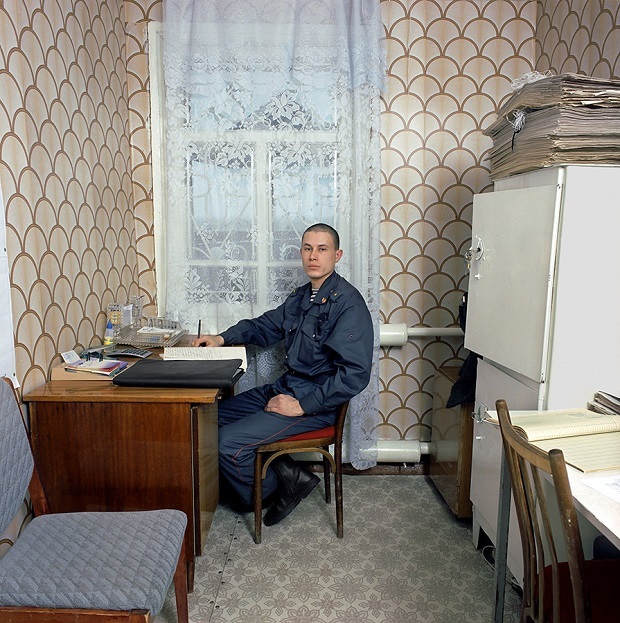 1976) is the lone police officer in the Shegarsky territory (some 21,000 inhabitants), Tomsk province. He is still studying at the police academy in Novosibirsk. Bill has no phone and moves around on foot in a ten-werst radius around his station (one werst is 0.66 mile). Monthly salary: 6000 rubles ($ 214, euro 162). Dede McEachern (b. 1969) is director of licensing, Texas Department of Licensing and Regulations, in the state capital, Austin. Monthly salary: $ 5,833 (4,240 euro). Mohammed Mohammed Shams Adeen (about 1950) is manager of the garbage collection service in At-Tawilah, governorate Al-Mahweet. He is responsible for 11 employees and 4 workers. The garbage is being dumped and set on fire in the mountains outside the city. On the wall a letter from the prime minister about a banning order for smoking in public offices and two educational announcements, about Kleenex tissues that ought to be thrown in trash bins and “don’t cut trees, they are the property of all of us”. Monthly salary: 29.000 Riyals (US$ 163, euro 112). Alham Abdulwaze Nuzeli (b. 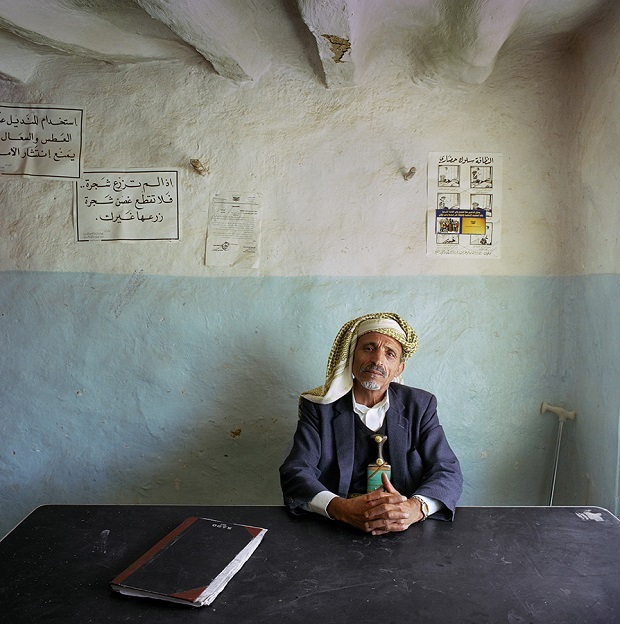 1982) works at the regional office of the Ministry of Tithing and Alms in the city of Al-Mahwit, Al-Mahwit governorate. Monthly salary: 12,000 rial ($ 67, euro 46). Behind het a portrait of president Saleh of Yemen.